Usually I plan a little ahead on the days that I work and have some idea of what we are going to have for dinner. Yesterday, though, I didn't. So on my way home from work I called Moe to see if he had any suggestions for dinner. I had to stop at the grocery store and pick up a few things and my first thought was I would just pick up a couple of steaks to grill. But Moe suggested that I just make breakfast for dinner. (He loves breakfast). So dinner was another simple meal. 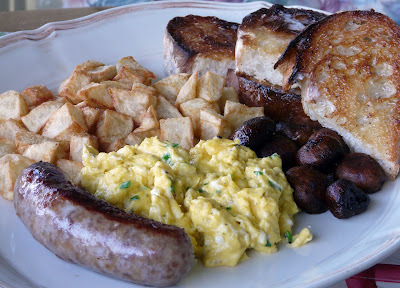 I fried a couple of bratwurst sausage, cut up and fried potatoes, sauted mushrooms and scrambled some farm fresh eggs with chives. Served with toast made from homemade bread. I know what we are having for dinner tonight. I have a lovely little rack of pork. I've rubbed it with lots of garlic, sage and black pepper and Moe will put it in the oven for me later this afternoon so that it will be almost done by the time I get home. Oh, that looks so good. I enjoy this kind of deliciousness any time of day. I would really enjoy it right now as a matter of fact. I'm serious..how many marriage proposals do you get in one week? Your bread looks perfect to me w/ all the butter in the right places..! Cathy, Just like Moe, He would be happy with breakfast any time of day. Debby, I hope you like the ribs. They are my favourite. Monique, good thing that doesn't happen since Moe reads the blog every day.